The Devil Walks in Mattingly is many things: it’s a ghost story, a tale of suspense, a murder mystery, and ultimately a story of redemption. One thing it’s not is a fast read. Not because it’s not fascinating but because the writing is so rich and has so many layers of meaning you’ll want to go slowly so as not to miss anything. It’s been a long time since I’ve seen language this lyrical; even the dialogue, as natural as it feels, falls on the ear like modern-day Shakespeare. The story is primarily told by Jake, the sheriff of Mattingly, Virginia. At first glance, he seems to be a modern-day version of Mayberry’s Andy Griffith. Jake’s duties mostly consist of driving around the countryside, drinking coffee with the locals, and hauling an elderly widow lady to the grocery store. In lieu of a gun, he carries a bloodstained tomahawk, a weapon so fearsome it has a name (Bessie) and a history all its own. (In fact, Bessie has so much personality she’s practically a character in her own right.) Jake is a happily married man with a young son. His life should be good; it’s not. Jake is haunted—by memories of past mistakes, by recurring nightmares, and quite possibly by something otherworldly. Something that’s coming for him . . . and for his wife, Kate, as well. Kate has her own memories to deal with, which translates to ongoing, futile attempts to atone for her sins. While Kate helps a lot of people, nothing she does helps her deal with the burden she has carried so long. When the peace of their quiet little town is shattered by violence, both Jake and Kate will be forced to come to terms with their past if they’re going to have a future. While the underlying theme of the book is redemption, which author Billy Coffey says is “a big theme in all of my novels,” there’s no obvious ‘come to Jesus; here’s how’ message as often seen in simpler stories. In fact, readers will find several aspects of this mystical plot that at first glance don’t necessarily appear to line up with New Testament theology. That’s another reason to read this one slowly; to unpack the layers of meaning that are sometimes as shrouded in mist as the depths of the inappropriately-named Happy Hollow. Coffey said “I had to decide early on if I was going to consider myself a Christian fiction writer or a fiction writer who happens to be a Christian. I’ve opted for the latter.” No judgment here, just giving sensitive readers intel upfront about what kind of story they’re getting into. 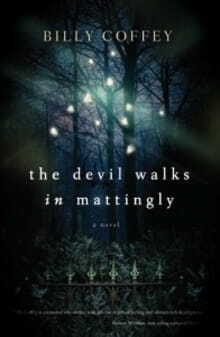 Those who enjoy this beautiful, mysterious novel will want to know The Devil Walks in Mattingly is set in the same location as—albeit four years earlier than—Coffee’s earlier novel, When Mockingbirds Sing. A thoughtful note from the publisher assures readers they “can be read in any order.” One final piece of advice: When you reach the last page, take a moment to go back and re-read the prologue titled “The End.” It’s more satisfying the second time around.